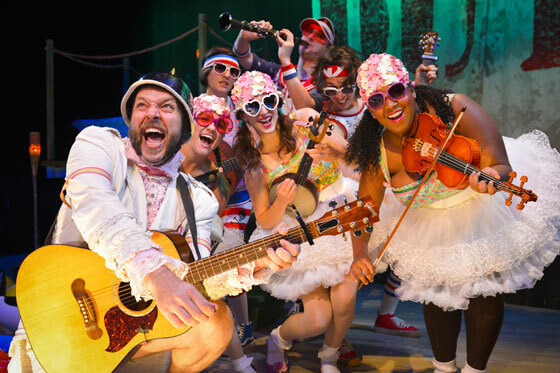 If you’re in the mood for a hopping party and a performance with a wild storyline, The Hypocrites’ Pirates of Penzance , which has its West Coast premiere at Berkeley Rep, hits the sweet spot. The Hypocrites, a Chicago theater group founded by Sean Graney, has reimagined Gilbert and Sullivan’s Pirates of Penzance into a fully interactive immersion experience. The result is an offshoot that shares the original classic’s spirit but is fresh and new, one of the most dynamic, zany shows around. The family-friendly production has dropped anchor at the Osher Studio, Berkeley Rep’s new black-box performance space, located just across the street from its two main theaters. The genius in Penzance lies in the space’s promenade zone─a few of the front rows and a large central area the large area where there is no distinction between where the audience begins/ends and the performance space. The audience is invited to sit wherever they please–the floor, on the edge of a plastic pool, up in the mast of the ship–and to move about freely. 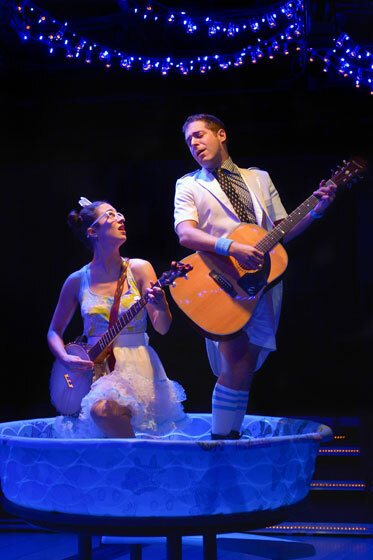 Spontaneous interaction between the audience and actors is encouraged and there are a lot of flying beach balls, of all sizes, being joyfully batted around, with ukuleles and banjos strumming. I took a ten-year-old with me to the opening performance and we arrived early enough to enjoy a delightful 15 minutes of “play therapy.” There’s also tiki-hut bar where alcohol and soft drinks can be bought at any time….just amble over and pay. The plot of this delightful musical is as topsy-turvy as the roaring sea─ right after Frederick (Zeke Sulkes) is released from his twenty-one year long apprenticeship to a band of merry pirates, he meets the web-footed matron Ruth (Christine Stulik) and, having never laid eyes on a woman before, doesn’t understand that there are many younger, more beautiful, female partners to be had. He quickly realizes the mistake he’s made when he meets Mabel (Christine Stulik) and her sisters, veritable sirens in bathing suits (Jenni M. Hadley, Kristen Magee, Becky Poole). They are all the daughters of Major-General Stanley (Matt Kahler). Frederick and Mabel fall in love immediately, which leaves him promised to both Ruth and Mabel. Frederick creates even bigger problems for himself when it comes to his contract with the pirates he has been contractually apprenticed to for the past 21 years. It is revealed that his birthday falls on leap year, so technically he has a birthday just once every four years. Out of honor, he (insanely) insists on serving the pirates another 63 years to complete the terms which state that he remain apprenticed to them until he turns age 21. Mabel promises to wait. When she and her sisters get dragged off by pirates, a stand-off and uproar ensues between the pirate king (Shawn Pfautsch) and the Major-General (Kahler). Its screwball humor to the nth degree. The production is carried off by an extremely talented cast who have an innate sense of comedic timing and can all sing and play instruments, and do an amazing job of navigating through onlookers to hit their marks. On opening night, it was a little difficult to grasp the full richness of some of the puns due to pronunciation and acoustics but that’s a detail that will have surely worked itself out by the time you read this review. Alison Sipple’s retro beachwear costumes take their inspiration from kids clothing, old floral cotton prints and striped sailor suits and canvas deck shoes and literally add another layer of wild color to an already over the top performance. No place for serious: A man who sat next to me on opening night in the lively promenade section had the audacity to spend the entire performance hibernating in a copy of The New Yorker. This guy, wearing a fully zipped vintage Members-Only jacket, kind of looked like a hunkered over turtle. Despite the many beach balls that bounced off him, he held his ground, never looking up, never smiling. If you’re looking for a serious drama, head for Berkeley Rep’s main stage. If you want a place where you can let your hair down and get a little crazy, Penzance is your show. Run-time: 1 hour and twenty minutes. At this show, you are free to move around and come and go and purchase refreshments, so there is no intermission. Details: The Hyporcites’ Pirates of Penzance closes December 20, 2105. The Osher Studio is located at 2055 Center Street, near the intersection of Center and Shattuck. The studio is in the Arts Passage, which runs between Addison and Center Strrets and you can access the passage from either side. Park as if you are attending a production in the main Berkeley Rep theaters and you will be fine as this is just across the street. Tickets: Risers: $55-65; Promenade: $40-50. Under age of 30 (Promenade) $25.